This textbook on group accounting provides a pan-European perspective, centred on European Union law and International Accounting Standards. This major new textbook on group accounting provides a pan-European perspective, centred on European Union law and International Accounting Standards. Group accounts is a difficult and technical area, but is a component of all higher-level academic financial accounting and reporting courses and on intermediate and advanced professional accountancy courses. The clear explanations and helpful pedagogic features, including many worked examples and questions with answers, ensure that readers will develop competence in the subject. 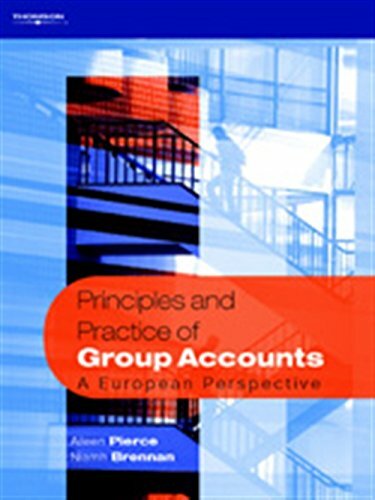 The book deals with the technicalities and detailed mechanics of group accounts preparation and covers both the techniques for preparation of group accounts and the legal and professional accounting regulations for group accounts. Principles and Practice of Group Accounts is aimed at third level accounting students and students taking professional accounting examinations. In addition, it will be of interest to practitioners as a reference book summarising all aspects of group accounts and containing examples of the application of group account regulations in published annual reports of major European companies. Its coverage of International Accounting Standards, and examples from a broad cross-section of European company annual reports, ensures that a European and international audience, as well as UK and Irish, will find the book invaluable. - Substantial chapters on the background and context of group accounts; - Detailed chapters on the regulations governing groups accounts including: - The impact of the EU Seventh Directive on Group Accounts - Financial Reporting Standards of the Accounting Standards Board - International Accounting Standards of the International Accounting Standards Committee (IASC, now IASB) - Examples from annual reports of a wide variety of UK and European companies, such as: 3i Group, Abbey National, Cadbury Schweppes, Ericsson, Nestle, Swiss Air, Unilever and Zeneca are included by way of illustration; - Discursive examples of technical points; - Comparison of UK and IASB regulations, in response to the requirement that all European listed companies will have to follow IAS generally accepted accounting principles by the year 2005; - End of chapter multiple-choice questions, self-study exercises and past examination questions. 4. Principles And Practice Of Group Accounts: A: Pierce A.